Helicopter flight to discover the Annapurnas is the nearby mountains, a magical journey and extraordinary. A dream trip, see the Annapurnas, Mount Fishtail or the Dhaulagiri view from above. Helicopter flight allows aerial photography of the Himalayas. Exceptional ! * The indicated price is “from”. The rate varies according to the group requested. 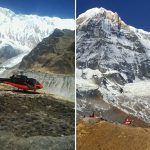 A helicopter ride in Nepal? We offer you an unforgettable and luxurious tour to discover the splendor of the Annapurnas, Hiunchuli, Mount Gangapurna, Dhaulagiri or Mount Fishtail. You will have a breathtaking view ! It’s the moment to do beautiful pictures in aerial views of the Himalayas and glaciers. 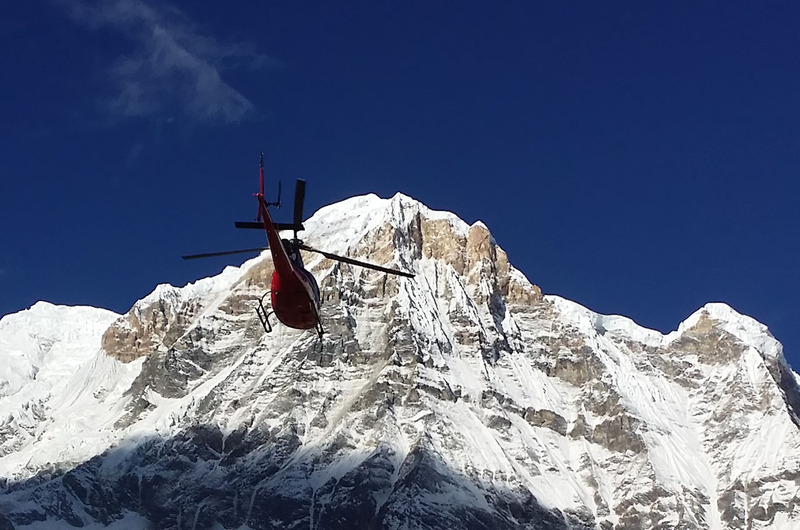 Make your dream come true with this Annapurna helicopter tour. We will leave in the morning. A bottle of Champagne will be on board to share a drink at Annapurna Base Camp to savor the scenery. A deposit of 50% is required upon booking. Cancellations made within 3 weeks before the initial booking date will not be refunded (unless canceled by Trek Dream Nepal). Any change of date is possible until one week before the date of the booking of the flight.